Immaculate Waterfront Home, Great View & Sunsets! 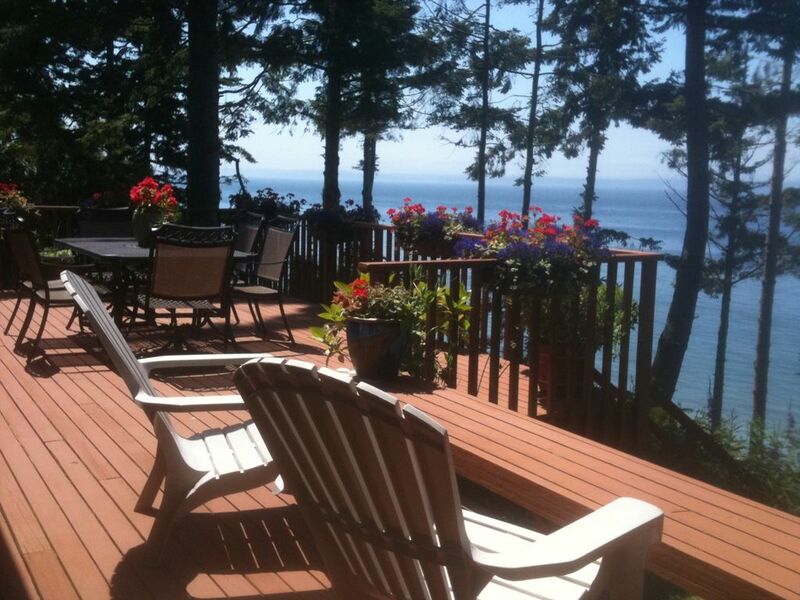 Enjoy this west facing mid-bank waterfront home on Whidbey Island. Home overlooks the Olympic Mountains, Port Townsend, ferries, shipping lanes and sunsets over the Strait of Juan de Fuca. The large private backyard deck provides all you need for dinner or a very happy hour - Weber propane grill and patio heater provided. Listen to the waves from a large deck and inside the house. Walk the beach below for miles and discover all of the Northwest wonders from rock collecting to low tide sea life discovery. Watch the many breathtaking sunsets in an area that receives only half the rainfall of Seattle. Watch the lights from Port Townsend across the Sound. Centrally located - ride the ferry to Port Townsend, enjoy dinner in the historic town of Coupeville, visit Greenbank Farm, Fort Casey, Langley and many Farmers Markets - to name just a few activities on Whidbey Island. Cook in the chef's kitchen which includes a new granite countertop, refrigerator, and dishwasher. Enjoy the warmth of the gas fireplace in the living room and an electric fireplace in the master bedroom. Sleep in the comfort of a king size bed in the master bedroom. A queen bed is provided in the guest room and a full size futon is provided in the den room. Take the trail on the property down to the beach or relax and have happy hour in the area above the water and enjoy a fire in the firepit. Take a swim in the community pool during the summer months. Enjoy a complimentary bottle of wine while you watch the sunset from the deck! If interested, check out our farmhouse/vineyard property on Whidbey Island #(1170125), located just 3 miles from the Driftwood Seaside retreat. Keywords: Westside Waterfront home, Central Whidbey Island, approx. 8 miles south of Coupeville, 3 miles from Greenbank and 5 miles from Coupeville-Port Townsend ferry. I am 63 years old and semi-retired living on Whidbey Island. I fell in love with this property the moment I entered the home and was struck by the unbelievable unending and changing view. This property has it all and is (I believe) a perfect vacation rental. Love watching the west view including the ships, Port Townsend and Olympic Mountains. Enjoy listening to the waves below and the unique forested lot. Chef's kitchen with all amenities. New granite countertop (2011) and dishwasher (2011) and wall oven (2013). Dining table for 4-6 persons. Breakfast bar seats 2. A trail is located on the property that leads to the bulkhead area just above the water. A firepit with plenty of firewood is provided there. This beach house exceeded all expectations. It was spacious with a great open design for the living. dining and cooking area. The master bedroom and deck look out on the Sound. It was fun marking time with the passage of the Pt Townsend Ferry on the horizon. Even with late spring weather, the snow-capped Olympus mountains would peek out for a breath taking view. Though the place is hidden by the beach near the end of a dead end road, it was close to all parts of the island. Easy beach access made for fun walks at low tide. We plan to return for a longer stay. Did I mention that Bruce was great. He found that we had left something behind and drove north to return it before we left the island. Loved the view, the location, well equipped kitchen, location. Very clean. Bruce was a great host. Our return visit to this property was just as much fun as the first. There was great communication with the owner, and we had everything that we needed for our stay. We will be back! Warm and inviting living room with full view of Olympic mountains and shipping lanes; great deck and master bedroom with the same view. Comfortable beds and beautiful kitchen area (withthe same view). The cooking equipment is average and the internet is weak (but that's true all over the island). We'd definitely stay there again. Bruce's house was a perfect for me and my friend's getaway. It is very well maintained, comfortable, and private. We enjoyed walking the beaches, visiting state parks, and a great meal at Christopher's in Coupeville. A community outdoor pool is available for use during the summer.